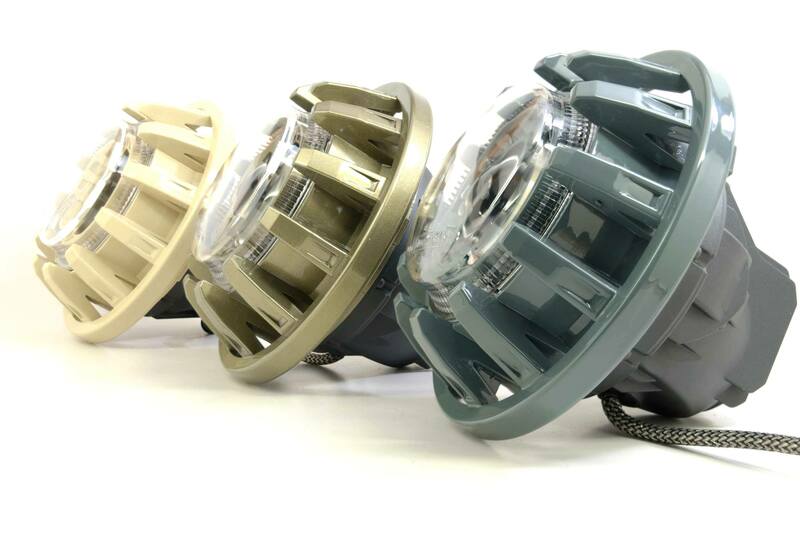 REVOLUTIONARY: The Super7 is the world first high-performance, fully modular Bi-LED replacement for all industry-standard 7″ Round Headlights. Nothing comes close to offering the same quality of light, the ability to customize the look, or the ease of assembly. 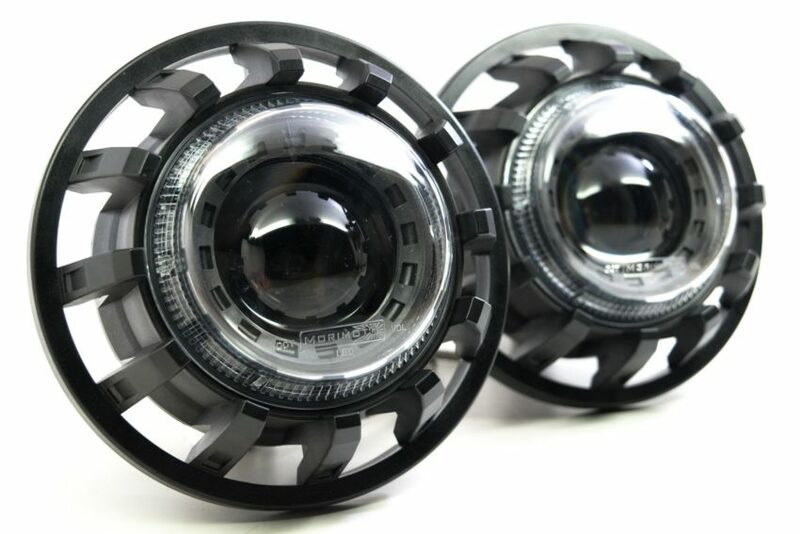 We are just as bored as you are with today’s selection of 7″ LED headlights for Jeeps, and that’s why we’re so excited about Morimoto’s new Super7! BI-LED: Unlike other options on the market that use reflector or generally inefficient multi-optic projector based setups, the Super7 is designed around Morimoto’s fantastic “M” Bi-LED projector. It’s Kuria-Optic clear lens and curved cutoff shield produce a beam pattern that’s supremely wide and well defined. 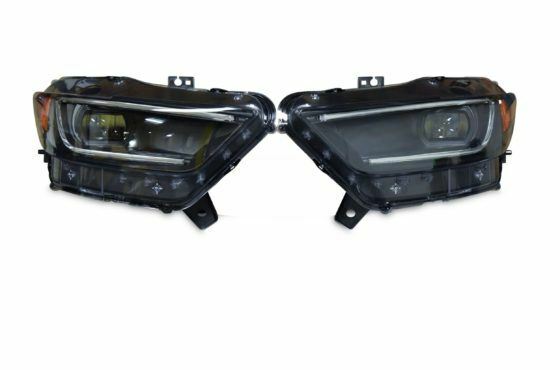 Powered by a specially developed 25W CSP chipset from Seoul SemiConductor that’s concentrated through a singular 3″ Lens, the Super7 headlights will easily out-perform everything else in their class, period. FORM & FUNCTION: We don’t really need to talk about how different this thing looks, we know you can see it. BUT, it’s worth noting that the headlight isn’t just designed this way for the hell of it. The aerodynamic design is purposeful in order to allow airflow to pass through the housing and cool the integrated heat sink at the rear – which is mated to the Bi-LED projector. Form indeed follows function, but it just so happens that form ended up a winner too. MODULAR: Because modifying Jeeps is about making them unique. The Super7’s modular design allows them to easily be customized. Want to add halos inside? hell yeah. Want us to etch the projector lenses with something special? easy. Want to color-match the housing to your Jeep? Go for it! Because they arrive to you ready-to-assemble: there is no need to take them apart in order to do what you wanna do with them, and we think that’s awesome. SEALED: Oh no! They don’t come assembled? Don’t worry, it’s easy. The projector bolts in. The housing and the lens bolt together with a simple but effective silicone compression seal in between. The wiring exits through the bottom, also through a specially designed silicon seal. If you’re smart enough to take the grille off your Wrangler to install these, then you’re handy enough to assemble them. No glue, no guesswork, no moisture, no problem! 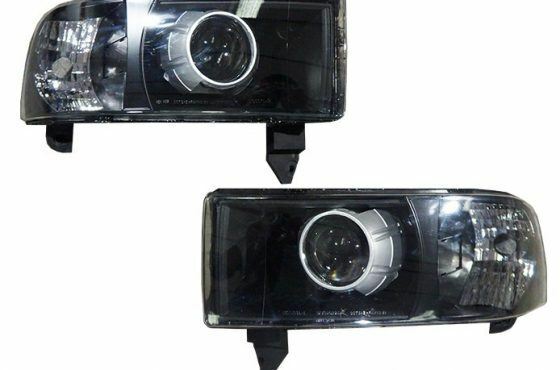 FITTED: The Super7 Headlights were designed specially for use on Jeep Wranglers. Countless prototypes were produced, fitted to a JK, and modified until the end result was something that fits like a glove. 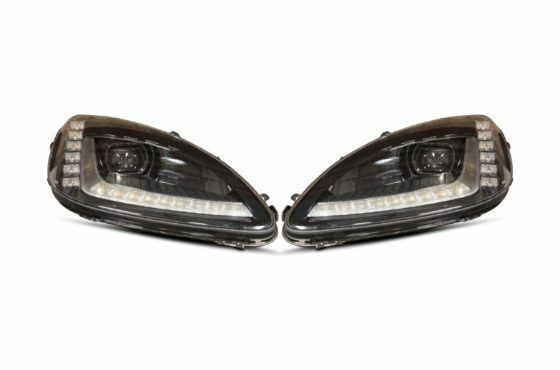 Zero interference with any structural components behind the headlights. No need to relocate the airbag sensor. Directly compatible with the existing mounting rings and hardware. Here, customizing your Jeep doesn’t mean compromising your Jeep. PLUG N PLAY: And flicker-free! There is no bulky/complicated relay harness to run for the Morimoto Super7 Headlights. 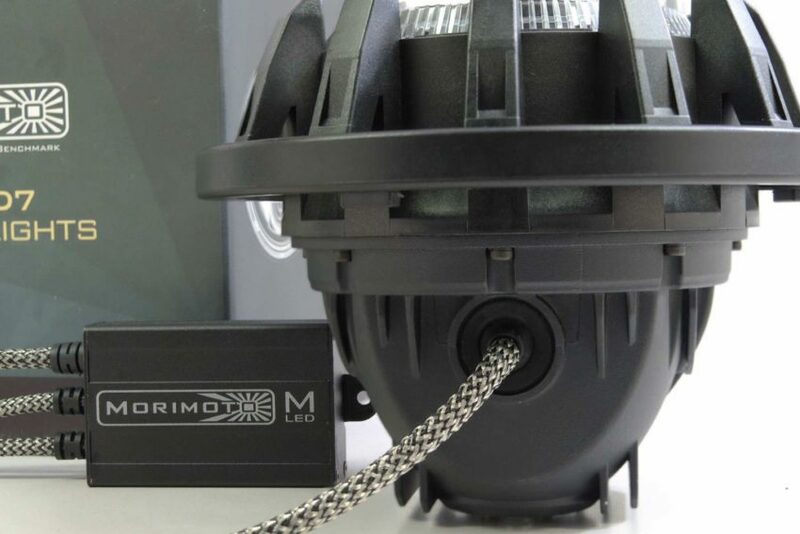 Just mount the external LED driver behind the housing, plug in the H13 or H4 connector to the factory outlet, and you’re ready to roll. OPTIONAL CUSTOM PAINT: We now offer custom factory-matched paint for the Super7! 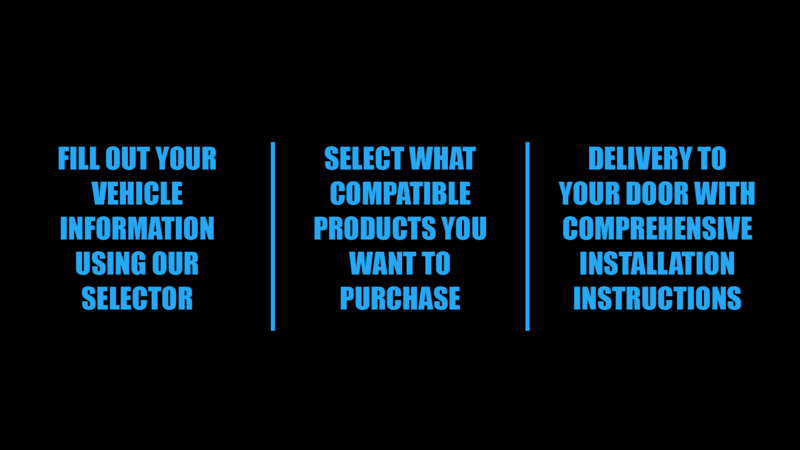 If you select this option, a rep will contact you to determine your stock paint code (Jeep JK, TJ, or other factory color codes). We’ll then hand the Super7 front half off to a body shop near and dear to us who whips up a batch of two or three-stage PPG paint for a durable yet spot-on color match to your rig. Talk about OEM+! NOTE: IF YOU SELECT THIS, PLEASE UNDERSTAND IT IS CUSTOM AND ALLOW FOR UP TO TEN (10) BUSINESS DAYS ADDITIONAL FOR THESE TO SHIP!